But I found myself thinking that this would be a nice opportunity to consider: just what does it mean to “succeed” or do well as an older adult? This is important, because our understanding of what is “success,” and what to strive for, is fundamental to how we judge ourselves and others. And for us as a society, articulating what’s involved in experiencing “good” or “successful” aging is important because it can help us understand what kinds of things we should focus on, to help more older adults age well, or otherwise “succeed” in late-life. So, just as philosophers and others have long debated what it means to “live a good life,” we should ask ourselves what it means to “succeed” as an older adult. This way, we can know whether we are “succeeding” as a society that supports and values its older population. This is not a simple question to answer. It has long been the subject of vigorous inquiry and debate in gerontology. In fact, the journal The Gerontologist devoted an entire issue to the topic of “Successful Aging” in 2015. I can’t summarize the debates on what constitutes successful aging here, but if you’d like to read more, this article from The Gerontologist offers a long and detailed overview of different ways that scholars have conceived of successful aging: Defining Successful Aging: A Tangible or Elusive Concept? And it’s certainly what many images of older adults convey: people who may “look older” but otherwise appear to do everything they could do earlier in life. This is what we see in this AARP “Disrupting Aging” video, in which millennials are confronted with some older adults who are much more able than the millennials had expected. But there’s an obvious problem with this conception of successful aging: many, if not most, older adults will eventually not be able to meet all three criteria. So have they failed? And: will we tend to judge that it’s their fault if they don’t remain disease- and impairment-free as they age? They propose that those who maintain good physical health, mental health, and engagement in social activities, without any conscious coping efforts, be referred to as “lucky agers”. The authors go on to describe how this can be done in a “preventive fashion” (e.g. anticipating a future or impending age-related stressor) and then also in a “corrective” way, which means making adaptations once a stressor or problem has occurred. To adapt, an older person must marshal both internal resources (attitude, optimism, coping with challenges) and external resources (available social support, finances, etc). You can see the model diagrammed out in Figure 1 of the article. In short: in this model, success is not defined as remaining free of disability or disease as one gets older. Instead, succeeding means finding ways to cope with impending or existing illnesses, losses, and other challenges, by getting help and by marshaling one’s own resilience and internal resources. In this way, despite experiencing losses and illness and “lack of person-environment fit” (e.g. a house that is a challenge or dangerous to live in), older people often find ways to meet these challenges. In doing so, they continue to find ways to experience positive outcomes such as life satisfaction, meaning, contentment, and they are still able to participate in valued activities. In other words, this model gives credit to those who acknowledge that their lives may or are changing, and purposefully engage in addressing this. This takes a certain courage. Which, in truth, is what most older adults muster when the time comes. But you’d never know it to see most media images of older adults, which either portray them as free of late-life stressors or instead emphasize their declines without highlighting their successes in adapting, and their ability to find meaning in a new normal. 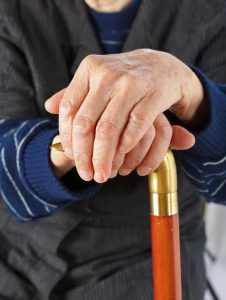 How can we support older adults in anticipating & coping with age-related challenges? Most people will encounter losses and impairments as they age. What if, as a society, we were less afraid of this, and instead embraced it as an opportunity to be proactive, and then to step up to challenges? What if as a society, we were better at acknowledging and celebrating the remarkable acts of resiliency and problem-solving that many older people are working their way through? What if older people felt more comfortable getting help when it becomes necessary? What if we were better at providing it? These are some of the things that I’ll be thinking about during Older Americans Month. People really can engage at any age. Now tell me: what comes to mind when you think of “successful aging”? And what could we collectively do to help more older adults feel successful? the deep assumption that individuals are exclusively responsible for how they age. In addition, while we know from previous research that the public maintains an ideal vision of aging, this “ideal” is uncontested in these stories, leaving people with a view of aging that, according to experts, is deeply unrealistic. We must find ways to make it easier for aging adults to get the support they need, both to proactively prepare for late-life stressors and to help them adapt when they occur. The post What is “Successful Aging”? appeared first on Better Health While Aging.